Palm's webOS smartphones, the Palm Pre Plus and Pixi Plus, will be arriving on AT&T "in the coming months." AT&T's 80 million customers will soon have a new choice for staying connected in their fast-paced lives -- the Palm(R) webOS(TM) platform. 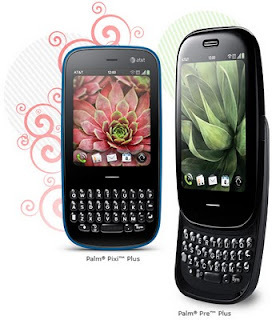 Palm, Inc. (NASDAQ:PALM) today announced that the Palm Pre(TM) Plus and Palm Pixi(TM) Plus phones will be available on the nation's fastest 3G network for $149.99 and $49.99, respectively, with a two-year service agreement and after a $100 mail-in rebate. "AT&T and Palm have a history of smartphone leadership, and today's announcement is a significant milestone for us," said Jon Rubinstein, Palm chairman and chief executive officer. "With Palm webOS phones coming to AT&T, Palm can help most anyone in the United States stay connected so they never miss a thing." "We're offering our customers even greater choice by adding Palm Pre Plus and Palm Pixi Plus to the nation's best smartphone portfolio," said Jeff Bradley, senior vice president, Devices, AT&T Mobility and Consumer Markets. "Palm webOS plus included access to the nation's largest Wi-Fi network and the ability to talk and surf the web at the same time is a powerful combination." Palm Pre Plus and Palm Pixi Plus will be available in AT&T stores and online at www.wireless.att.com in the coming months for $149.99 and $49.99, respectively, with a two-year service agreement and after a $100 mail-in rebate. More information is available at www.att.com/webOS. With all of the negative press that Palm has received over the last week or two, I'm really surprised that Palm isn't talking about ship dates for the AT&T versions of their webOS phones. I realize that carrier testing can be sort of a mystic black art that can consume lots of time of software developers and system engineers both at Palm and AT&T. I really do believe that time is of the essence here and that Palm and all of their carrier partners here in the US really need to take things up a notch and get on the ball with their marketing A-game so to speak. You can read today's full press release on the Palm website.